If you own a swimming pool and have enjoyed using it for some years, you probably have noticed that after years of use, it begins to show signs of wear and tear. A pool is a great source of family fun and entertainment for your guests, but as the years go by, it may start to tell you it needs some attention. 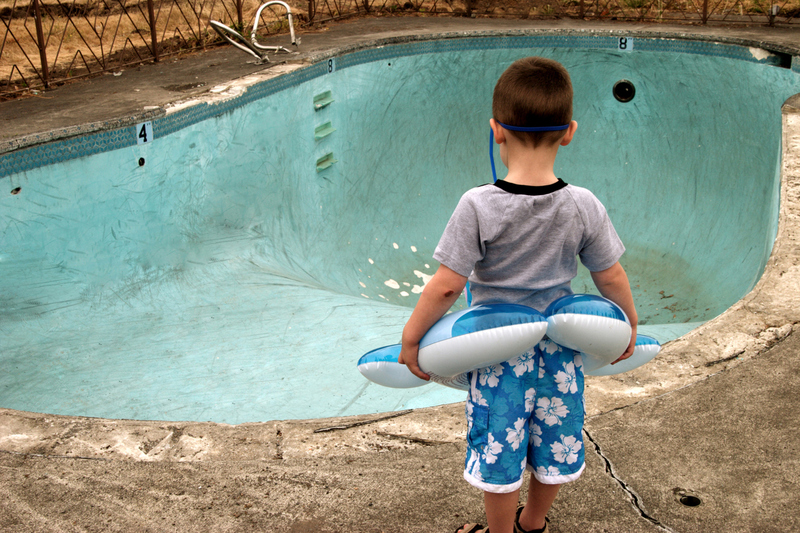 Pool Troopers would like to help you learn more about what can occur with your pool that are common signs of wear and tear. Some issues can be repaired, while others call for replacement. With a bit of knowledge, you will be better prepared to keep up with pool maintenance before it becomes a costly problem or safety issue for your family and guests. Your pool’s finish is a part of your pool that wears out. It will eventually need to be done over. Cracks, hollow spots, wear out spots are all things you might see. If the pool finish is new and this issue occurs, then there is an issue with the application of the finish. If the pool is older, then these wear out issues and the finish needs to be redone. It is normal to see small hairline cracks in an older inground pool. These are easy to fix. Larger cracks can potentially mean major issues for your pool. Typically a pool finish should last between 10-14 years and perhaps more with some of the modern pebble type finishes. When redoing your pool’s finish you may want to have an assessment from a pool professional to see if there are other areas of improvement that need to be addressed while the pool is empty, such as adding returns for better circulation or a dedicated pressure line for an automatic pool cleaner, or a channel drain for up to date suction safety. It is important to make sure that the cracks are not being caused by a bigger underlying problem such as underground tree roots. If a professional does identify these problems it is important to fix before it causes further problems in your pool and possibly even your home. When doing work on your pool, you can look into remodeling options to modernize and update your pool for style and savings. Remodels can, of course, get more involved with adding spas and benches etc., your budget and imagination is the limit here. Water line tiles serve three functions in your pool. First they are non-porous, good in either wet or dry conditions so they are perfect for the water line where half the tile is designed to be below the water and half dry above. Second they are an easily cleaned material at the water line where most dirt, debris and oils collect on the surface of your pool. Third, they are a decorative addition to the pool and a finishing touch to the projects color palate. As your pool’s tile ages the grout can fail and come out, the tiles can pop off and break and the tile line can become unsightly. It is important to address these issues as broken tile can be a sharp cutting hazard in your pool. Always consider redoing the tile when refinishing the pool. Updating your pool tiles can also be an easy way to upgrade your pool and switch things up. Pool Troopers does not recommend in most situation to have a pool remodeler put tile over tile. Get multiple opinions if someone is recommending tile over tile in your remodeling project. Leaking plumbing should always be replaced, with patches used only as temporary emergency repairs. It may take some time to find the source of the leak, and a professional should be called in if it is not readily determined. If you need to call in a professional to determine where the leak is coming from, there are several things that you can do to make it easier for them and save time. Before their visit, clear the pool of all toys and clean up floating debris. The water should be clear and clean with the water level at the midpoint of the tile line halfway up the skimmer opening. A great time to reassess the equipment pad plumbing is during a remodel. Most older pools were made under outdated plumbing requirements and a pool professional can greatly increase the hydraulic efficiency of your pool, saving you money and allowing your pool equipment to work at its best. Here at Pool Troopers, we can help you to fix and replace broken or damaged pool parts. We also offer pool heaters, motors, and automation. While wear and tear is completely normal, there are things you can do to help combat expensive problems associated with having to repair your pool prematurely. 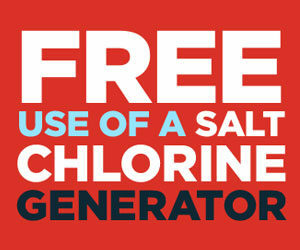 General upkeep can prolong the life of your pool. Additionally, using a pool service like Pool Troopers that offers both chemical and cleaning services to maintain your pool is a good first step. Certain products such as pool covers and automatic cleaners may help you maintain your pool but regular attention by a pool professional can help you identify early warning signs of damages that can be fixed rather than requiring a total redo too soon. Wear and tear on your pool cannot be avoided as materials age. In the meantime, keeping your pool in its best swimming conditions includes regular pool maintenance to ensure that the water is best for swimming. Our Pool Troopers repair service can provide licensed mechanics to repair issues before they become major problems. We can replace pool parts and equipment, as well as repair pool finishes, tiles, and plumbing. We can replace pool heaters or motors and even help fix pool automation. 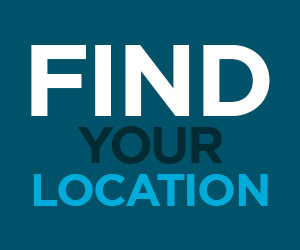 If you are replacing something electrical, we can help you find money and energy-saving options. Schedule an appointment with us today for all of your maintenance or repair needs. 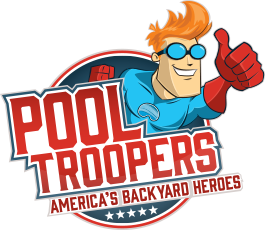 Pool Troopers is there for emergencies; after all, we’ve got your back.